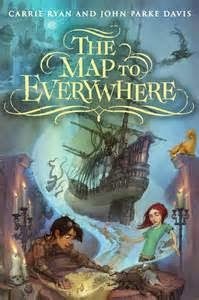 So Marrill and Fin both want to find their way to their mothers, and the wizard Ardent's own quest might be their only hope. He is searching for the pieces of the great map that gives its user a measure of control over the Pirate Stream--if they can put it together, they can maybe find their ways to where they want to be. But the Oracle is also looking for the map--and if he gets a hold of it, he'll be able to end the world. The first part of the book sets things up just beautifully. Marrill and Fin quickly become people to care about. Fin, with his truly poignant curse of forgetability, is my favorite boy character in this year's crop of middle grade fantasy. The authors do a really good job presenting the problems, opportunities, and pain of his disability, and making them part of the story. And the world of the Pirate Stream is fascinating, and the quest of the map promises a nice structure for the adventure to come. I was, though, somewhat disappointed by the actual adventuring in this first book, which basically consists of two distinct episodes of Magical Encounter on land interspersed with the Oracle showing up, and not being quite ready to defeat the crew of the Enterprising Kraken (because of having to wait until everything is happening the way his prophecies said it would). There were also confusing pirates who I found distracting (but that is a personal weakness). Both the two magical adventures had a Phantom Tollbooth feel to them--if you like the Phantom Tollbooth, you'll probably enjoy them more than I did. I myself don't really like episodes of quirky, imaginative fun that feel to me self-consciously aware that they are offering quirky, imaginative fun. For instance, in the second adventure, which takes place in a setting so cold words freeze when they come from your mouth, the antagonist is identified as "the Naysayer" by the authors, not by anyone within the book (to the best of my knowledge). It just felt a bit too much "children having a magical adventure!" as opposed to "this is a story that is making me be right there, emotionally committed and believing in it 100%. And here's Stephanie's review, at Views From the Tesseract, which is also glowing. I do love The Phantom Tollbooth, because I think it manages quirkiness extremely well, but in most cases, I get fed up with quirk for quirk's sake. If you do try this one (and you might well enjoy it lots), let me know what you think! That's exactly why I didn't like The Girl Who Circumnavigated Fairyland: because it felt too obviously like, "This is a whimsical, imaginative adventure—look, here's something else whimsical, and oh, isn't imagination important?" But I like what you say about the characters in this one, so I might give it a try. I can put up with a lot if I like the characters! I haven't read this one- but I do love the cover and title. I also liked hearing your thoughts on it and the honesty of your review is helpful. :) Thanks for sharing!